neighbourhood “El Poblado”, just 5 minutes walk from Parque Lleras and Poblado Park. You’ll have classes in a calm area, which allows you to fully focus on your studies. The school is surrounded by beautiful green areas and parks. At the same time, just two blocks away, you find yourself in “Poblado Avenue”, close to the best restaurants, hotels, bars and points of interest of the city. Each week, the language school organizes three free activities. These include, for example, a salsa lesson, cooking class, movie night, guided tour of the old town, visit to museums, karaoke, etc. In addition they organize an excursion every weekend (these excrusions do have a price). For any of the following courses there are six levels: A1, A2, B1, B2, C1, C2. Once submitting the entry tests and after being accurately analyzed, the students join the corresponding level. The standard intensive course of 20 lessons per week is specially designed for students to learn to communicate efficiently in everyday life situations. Lessons take place in the morning, from 9:00 – 12:40 (including a break from 10:40-11:00). The focus during classes is on grammar, vocabulary, pronunciation, reading, writing, oral and written comprehension. Of you choose the course with 30 lessons per week, apart form the 20 standard lessons, you'll have two additional conversation classes per day (during the afternoons), to help improve oral communication and gain fluency and confidence. Private bathroom available on request: € 47 per week. The combined mini group course combines 20 lessons in groups with individual tuition. You can help to decide about the contents of these extra lessons, for example, you can choose additional conversation and culture lessons but you can also choose something very different like literature, business Spanish or medical Spanish. The group lessons take place in the morning, the individual lessons in the afternoon. Private courses are intended for students who have a specific requirement or limited hours. The teacher adapts his class in terms of the student needs. This course is also made for students who wish to address specific issues in relation to the Spanish for business (medicine, law, finance). You can choose between different amounts of lessons per weke, e.g. 10, 20 or 30 lessons, and the schedule is flexible according the students' needs. 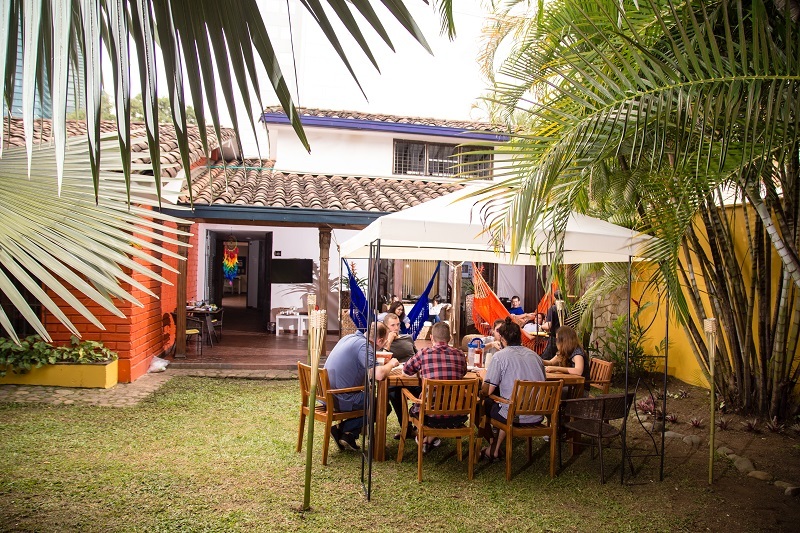 By staying in the residence in Medellín, you will enjoy our very comfortable amenities: large rooms, equipped kitchen available for cooking with your friends, garden with BBQ, fireplace for cool nights, free WiFi. You will be a 5-minute walk from Parque Lleras, so when you decide to go out at night, it won’t be a problem to go back home. Against a supplement, you can book a private bathroom. Living with a Colombian family is a great way to be in a total immersion with the language and especially with the Colombian culture. You can choose between a single or shared room (onyl when travelling together with someone). Since Medellin is a big city, the distance from the host family to the school can vary between 15 and 45 minutes on foot, but the homestays are always located close to metro stations and public transportation. A perfect choice for prospective students looking for a private yet wallet-friendly option. Students will stay in ‘semi private’ housing, with a private bedroom and shared kitchen and bathroom with a maximum of 2 other students. The school also offers comfortable studio apartments, within 20 minute walking distance from the school, for those who prefer to live independently. All apartments come with a well-equipped kitchen, WiFi access, fans and TV. Aagainst a surcharge, you can also opt for a superior apartment (with AC and hot water).